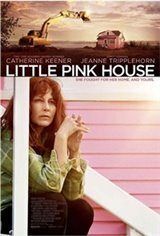 Based on a true story, a small-town nurse named Susette Kelo (Catherine Keener) is starting over after a messy divorce. She buys a rundown cottage in New London, Connecticut, refurbishes it with her own hands, paints it pink, meets a great guy (Callum Keith Rennie), and exhales.Meanwhile, the governor (Aaron Douglas) devises a plan. If he can rescue New London's sagging economy, he'll win re-election and position himself nicely for national office. The first step is to convince a big corporation to relocate to the blue-collar town. The governor taps Dr. Charlotte Wells (Jeanne Tripplehorn) to lead the redevelopment effort. She is ambitious, accomplished, and the closest thing the gritty town has to a celebrity. Charlotte attracts the attention of pharmaceutical giant Pfizer, whose execs are looking to expand their facilities because they have high hopes for a soon-to-be-released drug called Viagra. But there's a problem... the city plans to bulldoze Susette's neighborhood to clear the way for a new development that would support Pfizer's new research headquarters.With the help of a young lawyer named Scott Bullock (Giacomo Baessato), Susette emerges as the reluctant leader of her neighbors in an epic battle that goes all the way to the U.S. Supreme Court, inspires a nation, and helps millions of Americans protect their homes.